D-litter has born on 12.6.2012. 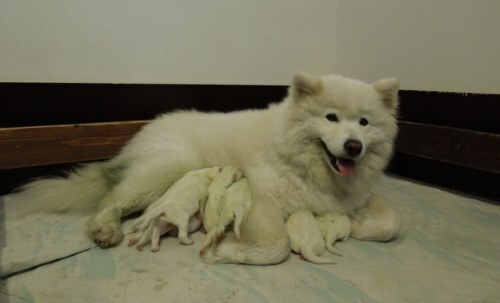 Six boys and two girls. Nuuka is Finnish beauty and working champion. 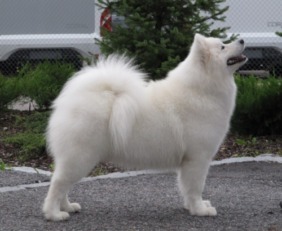 Rukka has also participated in dog shows a few times. 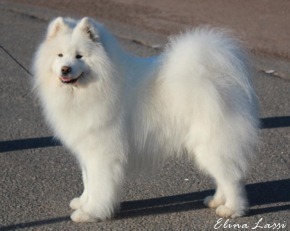 The best results was in puppy class in 2010 in Tarto, Estonia, when Rukka was Best In Show Puppy! She has got certificates from Finland, Estonia, Lithuania and Croatia. Rukka and Nuuka met twice in Kouvola. It was exciting to wait if there were puppies and then what kind of they would be. Of course we waited many girls, but boys were also welcome. We hope puppies to have nice smiling faces, excellent pigmentation, rich coats, good movement and adorable temperaments just like their parents. Maailmankorven Dancer In The Dark "Saga"
Maailmankorven Devil Wears Prada "Thelma"
Maailmankorven Dances With Wolves "Nemo"
Maailmankorven Deal Of The Century "Nimbus"